Today is March 8 2019 – International Women’s Day, and this years campaign theme is #MorePowerfulTogether. International Women’s Day strives to build a “gender balanced world”, but what does this actually mean? International Women’s Day has historically been a day to celebrate how far the world has come in moving towards gender equality. However it also acknowledges how far we still have to go in that battle. 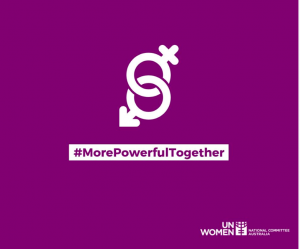 This years campaign recognises the importance of both genders and the huge impact and change we can have when we work together (rather than separately). This year is a call for balance, a call to share with each other and support each other, and most importantly a call to drive change where balance does not exist. Social Media – There is a big push this year for people to show their support via social media. Posting their views, supporting the campaign theme and spreading the word is important for there to be increased awareness and to drive change. Show Your Support – Support can be shown by wearing a purple ribbon. This indicates you are not only aware of the issues surrounding women’s rights, but also supportive of change. Attend an event – Attending an event in your local community can help to network, identify what you can do to further help and make change and to also show your support. Donate – Making a donation to a registered charity which supports Women’s Rights is another way to show support. These charities often use the funds raised to assist in communities around the world for equal rights. Be aware of how you think – to make changes globally, we need to start with us. Being aware of how we think, what we thing and when we think it, is incredibly important in terms of making change. When do we hold our own prejudices, when are we acting on habit or autopilot and when are the key times where we could be making behaviour change to make a difference? Be active in making change – The best way to make change is to actually do it. Say something, do something or speak out against inequality. To find out more about the action you can take head over to the UN Women webpage. What are you going to do today to #BalanceforBetter?